Never Enough Nails: Nicole by OPI Tink: Polishes Inspired by Tinker Bell! Nicole by OPI Tink: Polishes Inspired by Tinker Bell! The Nicole by OPI Tink collection was sent for review. All opinions are my own honest thoughts. I'm excited to show you four out of the six Nicole by OPI Tink polishes today. I am hoping this collection will be the start of some Disney/NOPI/OPI collaborations! Let's start off with Nicole by OPI Tink's In the Pink, a bright blue-pink near crelly. Tink's In the Pink has a nice squishy finish that isn't straight creme, but it is too opaque to be a real crelly. This color is more saturated and less kiddie-looking than bubblegum pink, but still nice and bright. I used three coats of Tink's In the Pink for full opacity. Due to it's crelly-ish finish, there was still a bit of VNL at two coats. This polish is one of those cremes that feels almost gel-like and that is my favorite kind of creme! It makes for such easy application! Nicole by OPI Fairy Fairy Quite Contrary is an interesting and awesome departure from the bright oranges we see at this time of year. This is more of a pumpkin-y burnt orange shade! I love me some bright oranges, but honestly I probably have 40 of them. I can't think of a dupe for Fairy Fairy Quite Contrary though! Nicole by OPI calls this "tangerine", but I just kept thinking of canned pumpkin! This is two coats of Fairy Fairy and the pigmentation was great! The polish was easy to apply and had the perfect not too thick or too thin texture. I LOVE weird bright pea green colors like Nicole by OPI Sweet On Pete! This green creme has a lot of yellow in it, and seems to be comparable to OPI Did It On 'Em, just by bottle comparison. Did It On 'Em looks a tad more green and slightly darker. I love all variations of this color personally, so I will be keeping both! If you'd like to see a comparison, please let me know in the comments. This is three coats of Sweet On Pete. The opacity was OK at two coats, but there were some streaks. As you can see, the streaks are still visible in some places with three coats- hence the "average" rating. I would recommend letting each coat dry completely before applying the next coat. Now this one is definitely a crelly! 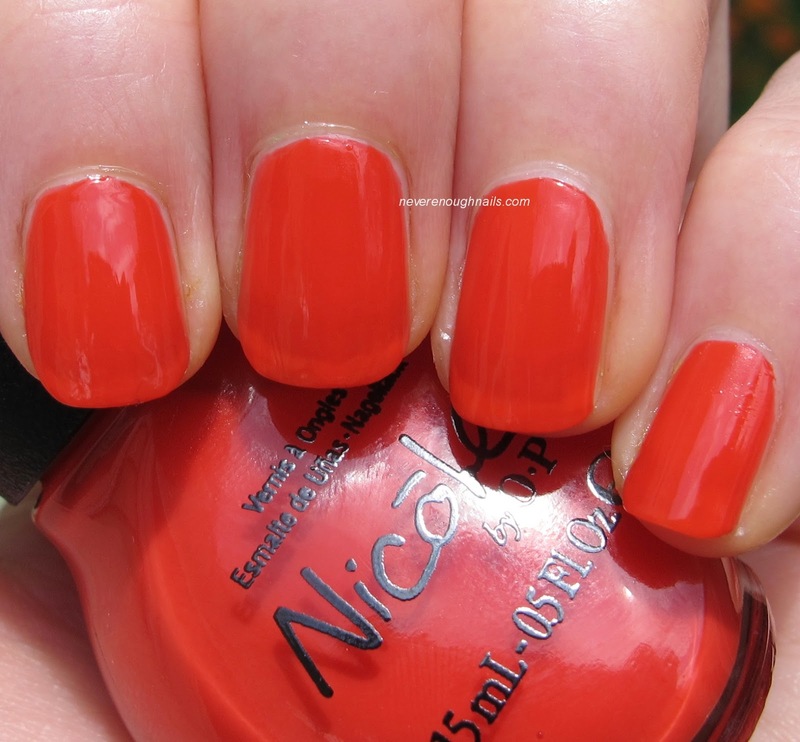 Nicole by OPI Half Charming Half Alarming is a coral red crelly (creme/jelly). It actual leans more towards the jelly side- I can see the mixing balls in the bottle, always a sure sign of a jelly. This color looked more coral on me in person. It looks very red in the pictures. 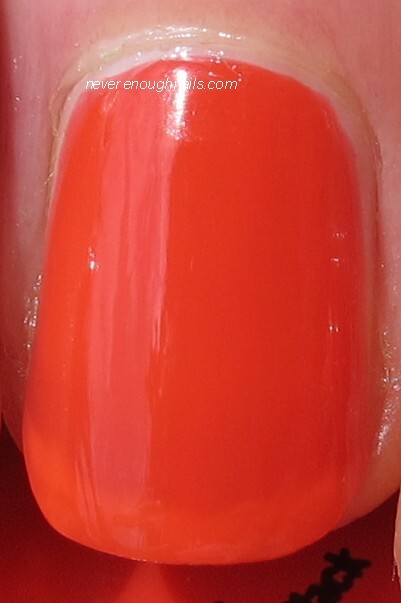 It is a gorgeous color for summer and one I will definitely be wearing a lot! I used top coat in these pictures, but it's really shiny alone too! This is three coats, and due to the jelly-ish finish, you can still see VNL. This never bothers me with crellies and jellies, only with full coverage cremes. I found the formula to be excellent, it had the gel feel that I love. There are two more polishes in this collection, Pixie Glitter- a holo silver glitter with moons! and How Fairy Nice of You- a very pale white pink. I am going to try to buy them if I see them in the store. I am all about a glitter with moons produced by a mass polish brand. Overall, I love the four I received. I really like that the pink and coral are crellies! I also love the slightly offbeat shades of Fairy Fairy Quite Contrary and Sweet On Pete. This limited edition collection will be available July 1, 2013 for $7.99 each at select Walgreens locations nationwide. Enter my giveaway for the chance to win a $25 Sephora gift card or $25 sent to your Paypal account! Awww...these nail colors are all so pretty. Among these colors, I prefer the pink one. I am an avid fan of pink shades! The pink has a really nice formula Sue! I definitely recommend it!